When I guide tourists on multiple days tropical birding tour in rainforest of West Papua, I often see a lot of kinds of lizards both big and small. 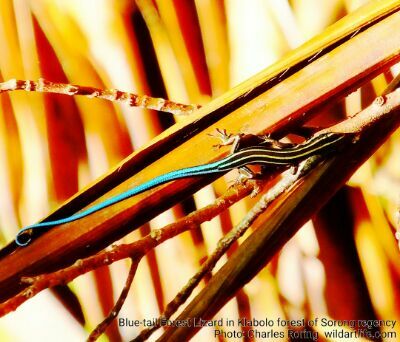 There are lizards that spend most of their time walking on the forest floor feeding on insects in wood debris but there are also big lizards that live in trees but often walk on the ground or swim in the water to find food. From my personal experience, the best sites of for seeing big lizards are in Klabolo forest of Sorong regency, in Tambrauw Mountains, and in Arfak range. Soa-soa Air (meaning Water Monitor Lizard) - This is a big lizard whose length could reach more than 1.3 meters. I saw it in several places such as Waigeo island of Raja Ampat, Triton bay of Kaimana, Mesirrokow forest of Manokwari, and Klabolo forest of Sorong regency. It is a big reptile compared to house gecko or blue tailed lizard found in lowland and lower montane forest of New Guinea. 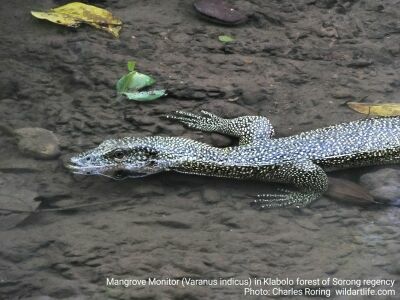 Based on its physical appearance, this lizard is scientifically known as Mangrove Monitor (Varanus indicus). Its skin is dark green or black and covered with yellow spots. It is fast in the water and can catch fish. The picture that I present in this article was taken in a small river in Klabolo forest. At that time I was guiding a Chinese lady and an Australian lady. We had finished watching Lesser Birds of Paradise and were walking back to our jungle hut. In the middle of the way, we saw the lizard staying still in the water. We immediately turned on our cameras and took pictures of the animal. Realizing that he was being watched by human, he began to move. First he was carefully slow but later he quickly disappeared into the water and left us.